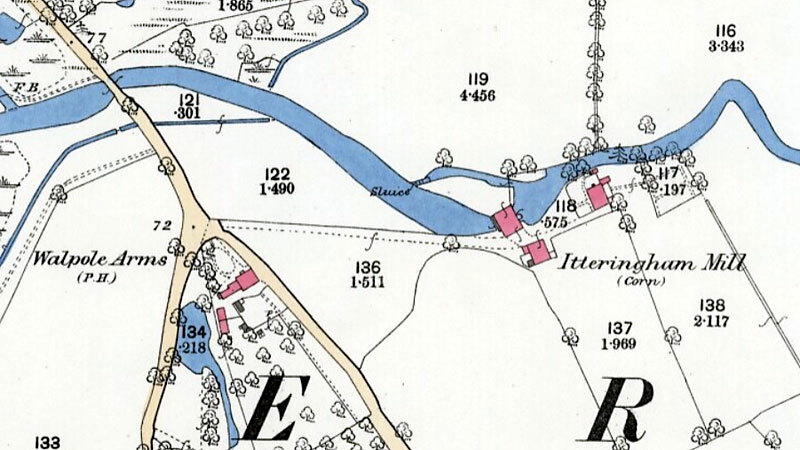 There has been a watermill in Itteringham since before the Domesday survey in the 11th Century and two mills were also recorded in the now amalgamated parish of Mannington. Ironically many mills tended to burn approximately every 200 years (mainly due to friction and large amounts of flour dust) and the present main structure was built in 1783. During renovation work in 1938, the builders discovered the inscription R.W. 1783 scratched in the plaster at the back of the water wheel and this was left intact.It was found again in April 2009 during the extensive alterations of that year. 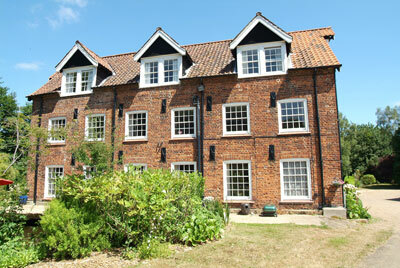 Itteringham mill was built of Norfolk red brick and had a Norfolk pantiled roof. The three distinctive two storey dormers and the lucum were all of white weatherboard. The millstones used during the latter years of production were all French burrstones, which meant that the mill was grinding wheat for flour. A small lockable drawer underneath a narrow window in one of the downstairs rooms of the mill cottage was still in situ in the 1970s and was probably originally used for taking payment and was once part of the original exterior wall. 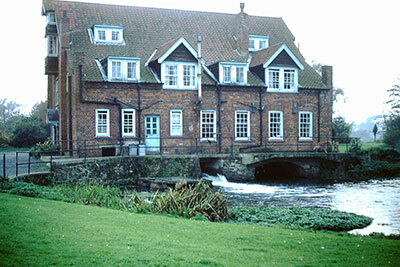 Itteringham watermill is the fourth mill down from the source of the Bure. 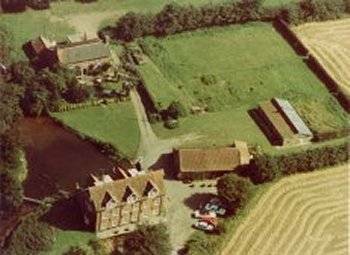 Herold was lord of the second manor at the first survey, but William Earl Warren at the Conqueror's, a freeman held of Herold 15 acres, there were 3 bordarers, one carucate and one acre of meadow, paunage for 4 swine, the right in half a mill, and was valued at 3s. In the reign of Henry II. the Earl Warren enfeoffed the ancestor of the family of Wolterton in this, who had a third part or portion in the advowson of the church, and this part passed (as may be seen in Wolterton ) together with their manor there, through many hands, to James Grey, Esq. and from his sisters to the Honourable Horace Walpole , Esq. 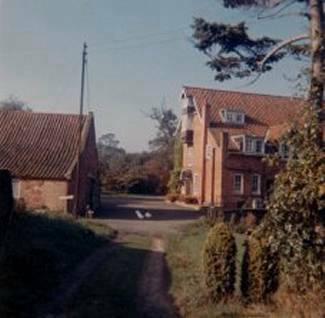 The master of the hospital of St. Thomas the Martyr at Beck-hall, in Billingford, owned the water- mill here in 1284, and Hugh Tirell of this town granted small rents out of lands here to Giles's hospital Norwich. 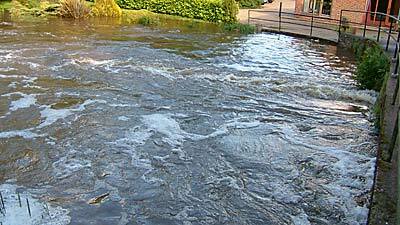 As with many watermills, the ancient course of the river was altered in order to provide a better head of water for the mill. This probably took place in the 1700s and involved the digging of a wide new cut some 250 yards long with a high bank on the northern side where the river was to be several feet higher than the surrounding terrain. 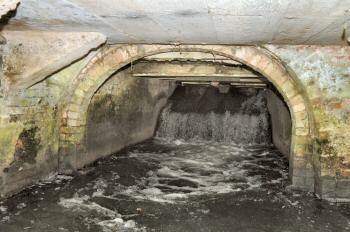 A bypass was also cut in to go around the north side of the mill in order to control the water in times of flood. Once the cut had been finished the old course would have been dammed allowing the river to back up and deepen to form a reservoir - the mill dam. It is probable that this work was undertaken during the tenure of William Colls. 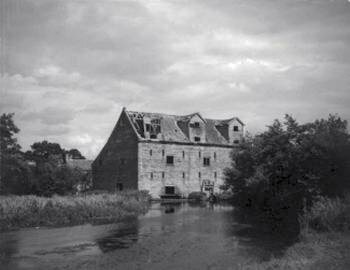 On 10th December 1783, William Colls leased the mill from the Hon. Horatio Walpole for 50 years at a rent of £40.00 per annum - new mill lately erected and built by William Colls on the site of the old mill that was lately standing on the premises. 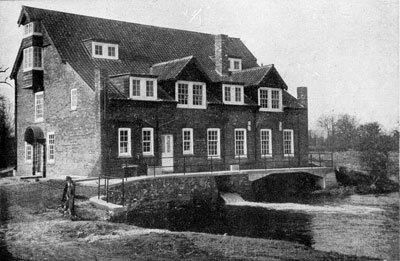 William Colls had already rebuilt the mill to power two pairs of stones. One pair were German Cullins for milling wheat to flour and the other pair consisted of a Derby Peak runnerstone over a French burr bedstone for milling rye. French burrstones were expensive and were almost exclusively used for flour milling, thus the above arrangement might have come about if the mill had been converted to rye milling by buying a cheap peak runnerstone. By 1831 an inventory showed that the wheel was now powering three pairs of stones via a 9 foot diameter spur wheel with a 7 foot diameter crown wheel set above it. Between 21st June and 11th August 1838, the Mill machinery was renovated by millwright James Winterborn of Aylsham for the Earl of Orford. The total cost was £50 11s 7½d. 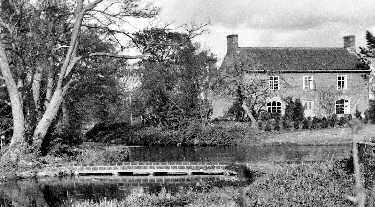 Various individuals from the village also took part in the renovation work including Nathaniel Brett, carpenter and wheelwright; Henry Hall, blacksmith, Edward and Samuel Slipper who worked with Henry Hall to remove some of the old machinery and Thomas Ward, bricklayer, who worked on the watercourses under the mill as well as repairing the various buildings. 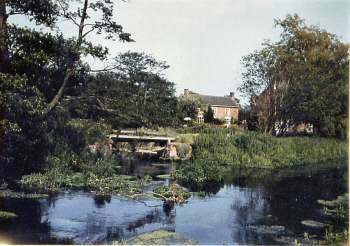 Probably since Domesday, if not earlier, Itteringham has had a large water mill at its present location near the bridge on the main road through the village. 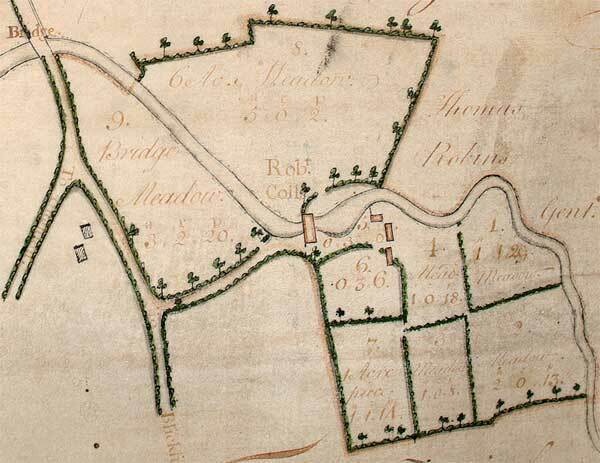 We know that in 1742 Robert Colls was renting the mill from Mannington estate and also held with it a small farm of 17 acres in 9 different pieces or fields. Fortunately a deed and associated working papers (WAL 367) has survived in the Walpole papers held in The Norfolk Archive Centre in Norwich which tells us quite a bit about the nature of the mill between 1783, at the start of a new lease, and 1838-39 when it was extensively repaired. This article summarises the facts but, being written by a non-expert, makes no attempt at interpreting precisely what sort of mill it was and its capability and efficiency relative to others of its time. 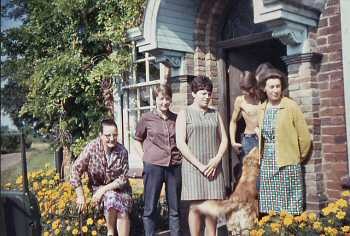 The December 1783 lease is for a period of 50 years at £40 per year rent. 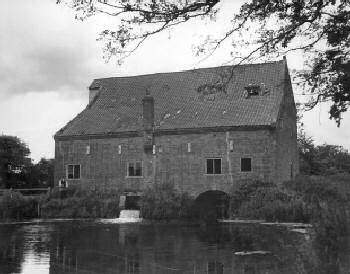 It refers in passing to the surrender of the previous lease to Robert Colls of September 1751 and covers the water mill and the associated dwelling, stables, outhouses, yards and the small farm holding then known as Itteringham Mill Farm. Various clauses cover the respective rights of landlord (Lord Walpole of Wolterton and his son Horatio Walpole) and tenant (William Colls of Itteringham, miller) relating to land use and farming practice – eg, game rights, timber rights and even prescriptions on crop rotation and the use of hay and corn straw. In amongst these clauses are two paragraphs relating specifically to the mill. They tell us that it had very recently been completely rebuilt – probably during the year or two prior to the new lease – and that it contained two pairs of millstones. 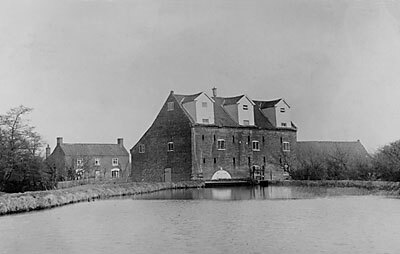 William’s father Robert had died in September 1777 and subsequent to taking over the family milling business William had taken the big decision to do a complete rebuild of the mill. Did he increase its capacity or had it for a long time been a large mill with two pairs of stones, one for wheat and one for rye? As we shall see, this clause is later invoked. 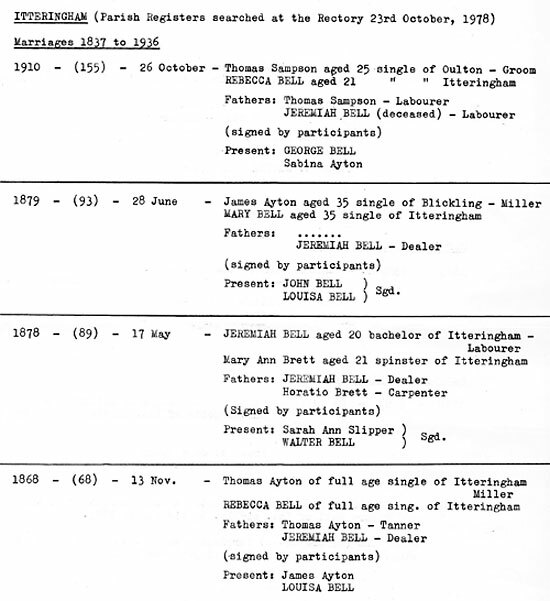 William Colls did not seem to have a totally lucky few years as miller in Itteringham. The parish burials register shows that he and his wife Mary suffered the loss of their daughter Mary in 1788 and the loss of twins George and John on the same day in 1789, presumably in childbirth. Until and indeed for some time after the 1800 burial of Hannah Colls aged 87 (no doubt the wife of Robert) there are no more Colls burials in the village. It seems William moved away. By early 1791 John Shelton had taken his place in the mill, as we know from the poor rate accounts. In turn by early 1800 Thomas Roberts had taken over as miller and remained there at least until the end of 1811 when the poor rates book ends. He was still in the village and presumably the mill in 1825, since in October of that year he was a witness at his daughter’s wedding in the parish church. He died aged 68 in March 1830 and was buried in Itteringham churchyard. At the moment we do not know precisely the occupancy sequence from then until the late 1830s. 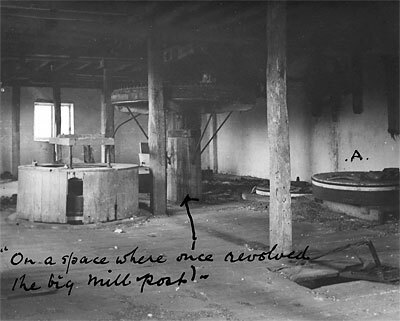 But we do know that an inventory of the mill mechanism was done in 1831, presumably at the time of a change of tenant. An inventory of Tenants’ going gears at Itteringham Mills in the County of Norfolk, taken the 14 th day of January 1831. A wood spar wheel 9 ft diameter – three wood stone pinions with wrought iron spindles. Brays [brace?] 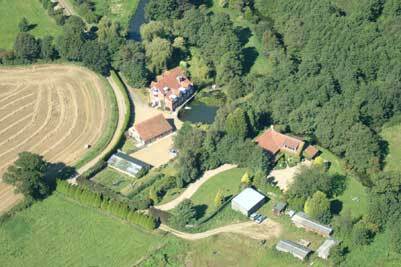 lightening-irons and brasses, two bridging-pots, five bray posts, casing in front of log-pit, and three meal troughs. Three sets of vats, hoppers, shoes, bearers, damsels, maces, ram-boxes, rings, stone-curbs, and joists. Two full sized flour mills with hoppers, shoes, driving-pullies, bags and jiggers. Dumper with three tiers of wire, hoppers, spout, bags, rigger, crank-shaft, bearing studs and jigger. Crown wheel 7 ft diameter, sack-tackle, nut with pulley, shaft, poppets and brays. Upstream flour-mill-nut with shaft, drum [and] two pullies, puppets, brays, strap and rope. Downstream flour-mill-nut with shaft, pulley, rope, brays and puppets. Grindstone 3 ft 6 in diameter with spindle, pulley, rope and frame. 9 feet step ladder. Sack tackle with pulley, shaft, brays, striking-lever and lines. Stripping-mill hopper, mealbinn, partition, round sack tackles, middlings-bag and 7 feet step ladder. Sack tackle, pullies and bearers. The ladders, say belong to landlord, the upwrite [upright] shaft wallower and spar wheel to ditto. Stones and vats – to value and allow difference according to agreement in old lease. From the 1838 documents it looks likely that this inventory was done for the use of the mill by John Gambling, but we cannot be sure since there are no names mentioned on the inventory. On then to the repairs of 1838; which, from the details in the various tradesmens’ bills, was clearly a major rebuild of the water conduits, the mill works and the adjacent buildings. As an introduction to the work described and bills submitted, we have an agreement drawn up between William Lemmon, Lord Walpole now the Earl of Orford’s steward or agent at Wolterton, and John Cook Beane now the miller. This commits to some contributions to costs by Orford which apparently supersedes the old lease obligation on the tenant to do repairs. By the absence of any other lease deed in these papers it seems likely that the 1783 lease deed, although more than four years over its term, was still effectively the basis for tenancy and rental arrangements. A commitment is also made to begin a new lease. Memorandum May 30 th 1838. The undersigned will engage with Mr John Cook Beane as to the repair of the Itteringham water mill, first condition is that Mr John Gambling of the parish of Buxton who claim[s] the machinery of the above mill which he it appears paid for the greater part thereof to a Mr Pinckard [or Pinskard?] as by an inventory, do appear, now if the said John Gambling do by his hand in writing give up the said machinery to the Earl of Orford without any remuneration, the following conditions are then agreed to by the undersigned on the behalf of the Earl of Orford. 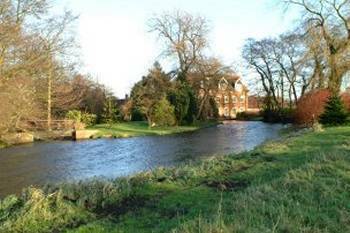 It is further agreed, by the undersigned W Lemmon, with the consent of the Earl of Orford, that the said John Cook Beane to have a lease of the water mill, premises and land, which are now occupied by JC Beane, for the term of fourteen years at the yearly rent of ninety pounds, to be paid half yearly, he performing such covenants as are usual between landlord and tenants. White’s 1845 Norfolk Directory tells us that in Buxton there was a corn millers and merchants called Cooke and Gambling (John). So John Cook Beane and John Gambling were in business together and W Lemmon could readily assume that in signing the agreement Beane would deliver Gambling’s written disclaimer to the machinery. There then follow a dozen or more bills, receipts and scraps of paper with calculations on the division of costs between landlord and tenant. These tell us what was done in the repairs by millwright, carpenter, blacksmith and bricklayer. After the millwright’s work the timber and carpentry bills were the most significant. Itteringham’s wheelwright Nathaniel Brett did the work, assisted by one man. His bill covers the period July to November 1838 and he charged Orford £6 14/7d for more or less a month’s worth of time at 2/6d per day each for himself and his man. Timber bills, over and above the sum charged by Winterborn, amounted to well over £10 in total; but not all purchases are itemised, with anonymous cash sums making up quite a large part of the total. At least some of the timber was bought from Isaac Preston and Son of Yarmouth. The local strongman played his part with a bill covering his work from late July to early August 1838. Most of the items in his bill refer to hoops and bolts and nails. He also charged for hoops and spikons to the water gates and for new chains for them. 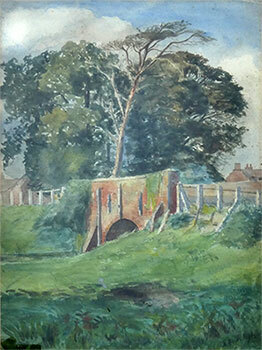 He also worked with Edward and Samuel Slipper from the village in 1839 to take down part of the ‘masheen in the mill’. He charged himself and his labourer out at the less substantial sum of 3/4d per day for the two of them. A handful of scraps of paper show various attempts to total the cost of work and to allocate costs between landlord and tenant. No single one of them appears to show a definitive total, but one shows a total of £124 ‘paid by Mr Beane’ and another allocates Mr Cook Beane £91. The total probably came to around £124 to £150. A nice footnote brings us back to ‘dilapidations’ of the grinding stones. A copy of a note from W Lemmon, presumably to John Cook Beane, of October 1839 says that he is sending him ‘the copy of the lease of Itteringham Mill in which you will see Lord Orford’s claim for the mill stones’. It goes on to claim £16 for the full 9 inches of wear on the pair of stones called Cullens, 7 inches of wear on the Peak and 3½ inches on the French stone. Mathew Arthur Slipper was known to be the illegitimate son of Charlott Tipple and the 4th Earl of Orford (1813-1994). He was born 18 June 1839 at Itteringham and was apprenticed as a miller at the mill before moving to work at Upper_Sheringham_postmill where he was listed as journeyman miller in the 1841 census. Later still he became the publican of the Lobster Inn at Sheringham. 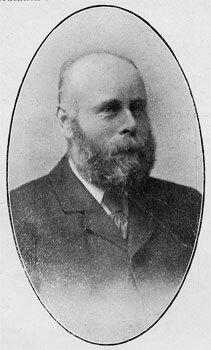 In 1861, he married Susan Cooper, who was born on 22nd December 1843 in Sheringham and they went on to have 10 children. Mathew Arthur Slipper died on 4th November 1919. Matthew Slipper was the illigitimate son of the 4th Earl of Orford. His mother Charlotte was a seamstress at Mannington Hall. She later married a Tipple and produced another child by him. I have a detailed family history which tells me that Matthew was still at the Lobster Inn, Sheringham, in 1902. He married Susan Cooper of Upper Sheringham. They had 10 children 8 of which survived. There are 2 graves in the churchyard at Upper Sheringham. He was much involved in the local leadership, now council. He handled the Poor Law money in Lower Sheringham. One of his sons was the Village Constable, another had a sweet shop and a third, my grandfather, was a grocer and two daughters were teachers at the Upper Sheringham School. He died in 1919 Much of this information was gleaned from books written by Peter Cox, a local councillor and a family history produced by a relative. 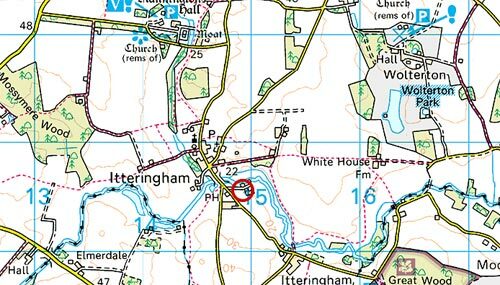 I have yet to discover why he was in Nottinghamshire when he died (perhaps one of his children lived there?) He is buried in West Bridgeford. 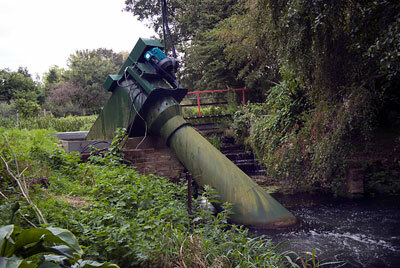 He was first apprenticed as a miller at Itteringham water-mill. He was not denied by the Earl and was baptised by Bishop Cremer-Cremer. The Earl had no other children ! The 1851 census showed that while the mill itself was being run by Frederick Copeman, the mill grounds were being run as a farm by William Hardmeat and his wife and they were living in the Mill House. 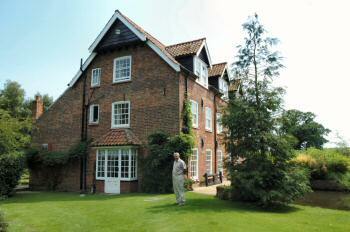 William was aged 30 and had been born in Cromer and his wife Amelia, also aged 30 had been born in Metton. 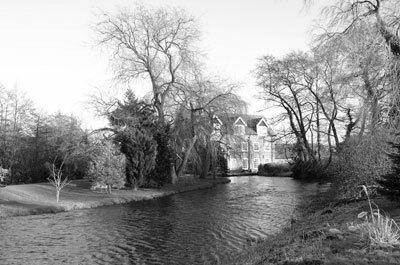 They were sharing part of the Mill House with one of Frederick Copeman's employees, Samuel Deane, aged 29 from Langmere, who was a journeyman miller. 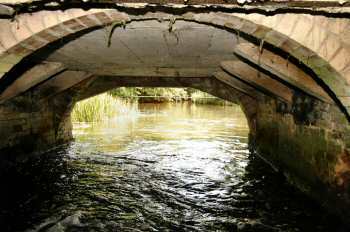 Sir, Having duly examined the Water Wheel and Shaft at Itteringham Mill I find it in a most delapidated condition and not in a fit state to be repaired. I therefore beg to lay before you an estimate. To take out the old Wheel and Shaft and fix in new ones. The wheel to be 16 feet diameter and 8 feet Wide, with three Cast Iron rings well fitted and bolted together, with Cast Iron Starts, Best Memel timber floats and back boards and all necessary bolts and nuts. One new Cast Iron Shaft to weigh about 35cwt., with neck carriages and wall plate with turned journals and Key and planed for hanging Wheel on Shaft, also two Gun Metal Neck Brasses, Cast and bored to fit the Same. Two Cast Iron Bosses and four Angles for hanging pit wheel on New Shaft, the above work, which shall be made of the best materials and sound workmanship for the sum of two hundred and seven pounds, ten shillings. Oak starts, 190. 10. -. 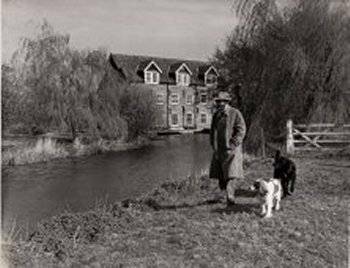 Frederick Copeman lived in the mill house, leasing Itteringham watermill from the Walpole Estate while owning Aylsham steam mill in Dunkirk. James_Brown, who was running the mill in 1864 was also a farmer and maltster. At one point in his career, he was probably also a tanner and lived at Tanyard Farm (later to become Bintry Farm). In 1828 he married Pleasance Copeman who was the daughter of Robert Copeman and sister of Frederick Copeman. One of James Brown's sons was Frank Brown, who by 1871, was running Roughton_Mill_Hill_towermill. Walter Marcom was there in those days. We used to see him out walking and he had a big boot on one foot and the sole was several inches thick. 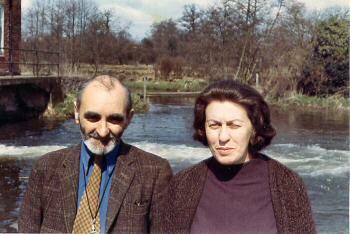 My name is Alex Marcon, eldest son of Walter Hubert Marcon who was the Miller from 1918- 1934. My Father trained me to operate the mill when I was 14 years of age when home on holiday from Paston School, North Walsham, Norfolk, in 1927. 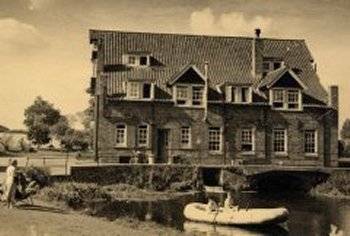 My father W. H. Marcon left the mill and the mill farm in autumn 1934 to take over a bigger farm at North Barningham so the mill was in operation to that date. After I left Paston in July at 16 years of age in 1929 I worked on my Father's farm running the Mill when required, grinding barley into meal and crushing oats for local Farmers who brought their sacks of grain to the Mill by horse and tumbrel, collecting the ground meal or oats when ready by the same means. 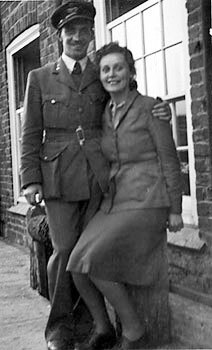 I left the UK at 16 years of age, emigrating to NZ in mid January 1930, being sponsored by a NZ farmer to work on his farm. I am now 98 years of age. I have many happy memories of the old mill as it was in my day. The mill had 3 floors above the ground floor, the grindstones were on the second floor, the hoppers which fed the grain into the grindstones on the third floor and the windlass on the fourth floor from which a chain went through hinged double doors about a yard wide to the bottom floor. The sacks of grain were tied at the top and the chain which had a loop on its end was put through the loop and over the tied top. 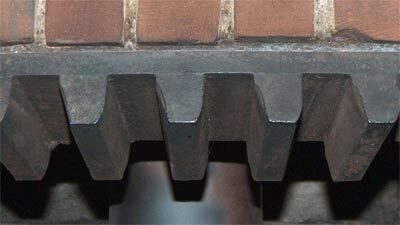 A simple mechanism which moved the belt across on the winch could be operated from any of the floors. 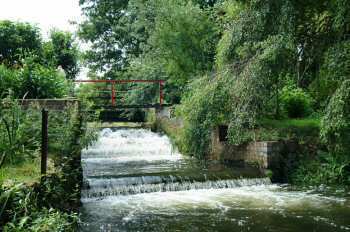 The whole machinery was driven by a water wheel which took all the water the River Bure contained into a mill race, to drive it. To my two brothers Gordon and Raymond and myself, as growing boys, the old mill was a paradise, and we had the run of it when not in use. There were steps to all the floors to run up and down and one area on the second floor from which the flour machinery had been removed was the length of a cricket pitch and half as wide. We made good use of it as a football pitch in the winter months, and a cricket pitch in the summer months - especially on wet days. The walls were lined with plaster over brick and took something of a battering from football and hard rubber cricket ball, so consequently there were numerous small pieces of plaster some of which got crushed into the floor. 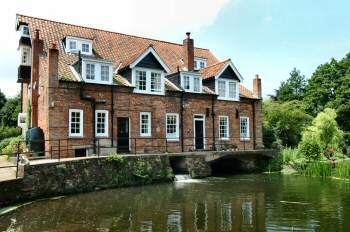 There were two dormer windows in this area one of which looked looked over the mill pool which was 14 feet deep in places and had several species of fresh water fish including trout. 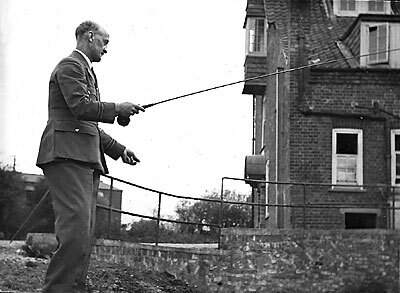 On one occasion Lord Orford from Wolterton Hall, who owned all the land in the district including the Mill and the village of Itteringham, was fishing in the pool. The temptation to have a bit of fun was too much for us and we took turns in picking up small pieces of plaster and throwing them out into the pool where the disturbed water attracted the Earl's attention and he immediately cast his fly in that direction - much to our amusement. This was repeated once too often however and the Earl looked up and saw us. 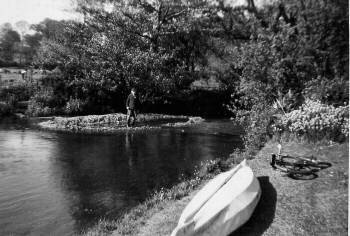 My father was visited by the river Game keeper and we got a good telling off but I noted as he turned away he had a grin on his face. The mill was reputed to be haunted and I really believe it was. I had a fox terrier dog who was constantly by my side when home for school holidays. 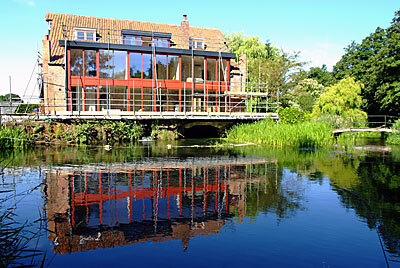 A small room on the ground floor overlooked the mill pool and served as an office. A shelf on one side contained account books going back to the 1800's, a desk at chest height was under the window and contained the one in current use. On one memorable occasion at the end of one of my days work I went to the office to fill in the details of whose corn was ground. The dog was with me. When I opened the door the dog growled and its hair stood on end, as did mine. I made a hasty exit and told my Father but I don't think he believed me. That little dog would never go into the mill again but curled up by the door until I came out. I eventually plucked up the courage to enter the office again but did not sense any 'Presence'. Sidney Wilch was the landlord of the Walpole Arms at the top of the mill drive. My Dad also worked at and ran the mill and he had a fish round. He would call the horse from the orchard but he wouldn't come so he would yell "Edith!" Mother would come and she would call "Jack!" and he'd come trotting over and Dad would put the harness on him. He would drive to the train station at Aylsham to get the fish. 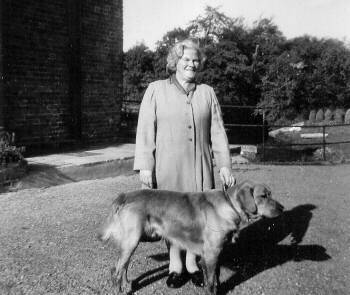 Gladys Broughton who lived in the village often used to go down to the mill at the age of 14 in 1920 and recalled that the whole establishment was run as a farm as well as a mill. Chickens would often be lost as they had a habit of roosting on the wheel and didn't always get off before it was started up. 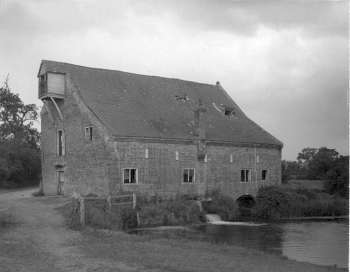 Itteringham Mill finally stopped working in 1934 when Walter Marcon moved to North Barningham to take over a larger farm. In May 1936, owner Lord Walpole contemplated bringing it back into use but subsequently decided to convert it into a dwelling. 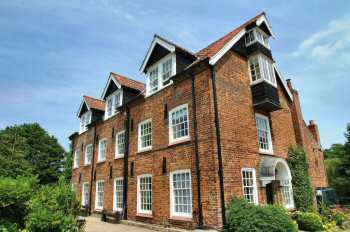 Two alternative sets of plans were drawn up by the Cromer builder Girling & Smith and work started on the favoured version on 13th July 1938. The total cost of the whole project was approximately £2,500.00 and the project was overseen and recorded by Ernest Edward Smith himself, who was 71 in that year. 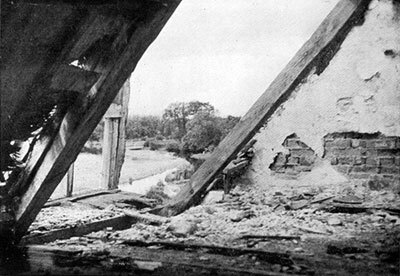 Some of the photographs he took are on a separate Itteringham_Mill_Conversion page. 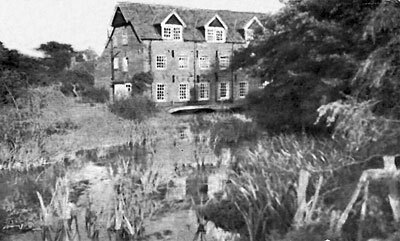 Girling & Smith later also converted Antingham_Upper_Bone_Mill to residential use c.1946. 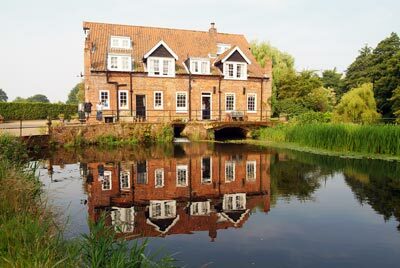 Amongst the old watermills of Norfolk, the mill at Itteringham, near Aylsham, must at one time have ranked as one of the most important. 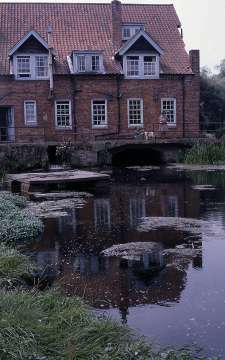 A substantial structure of local red bricks, and housung an undershot wheel of the type common to the majority of Norfolk water mills, it was built across the river Bure just outside Itteringham village in 1788, and there is no doubt that in the ensuing years it did yeoman sevice to the surrounding farmers until finally the march of modern methods compelled it to close down for good in 1913. For the next 25 years the building seems to have served no useful purpose and simply stood neglected, the sport of wind and weather, until in 1938 it had reached the state of delapidation and decay shown in our first illustrations. 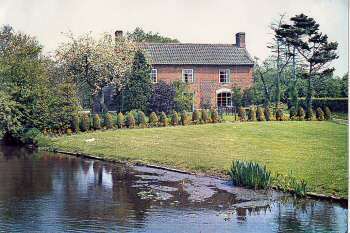 At this stage, however, the present owner, Lor Walpole, on whose estate the building stands, decided that it deserved a better fate and in consultation with his builders a plan was finally arrived at for reconstructing it as a private residence whilst still retaining the main features of the original. The work was carried out during the later half of 1938, and now the exterior elevations once again face the elements in as staunch and sound a trim as ever they did. But inside 'tis feared that the ghosts of the old millers would be hopelessly lost. Where once they stood and watched the golden grain trickle down to the rumbling stones, is now m'lady's boudoir with central heating and electric light, whilst the corn bins above have become light and airy bed rooms for staff or guest. And below, in the lounge, the walls which once housed the gurgling wheel now form the sides of an imposing brick fireplace with a section of the old main cog wheel worked into the mantle and one of the old mill stones taking pride of place in the centre of the hearth. The transformation, both inside and out, may well be judged by the accompanying illustrations. Thus do we endeavour to capture some small measure of the spirit of the past, and pass it on to future generations, hoiping that the result of our labours will stand the test of time as well as did the work of our ancestors. 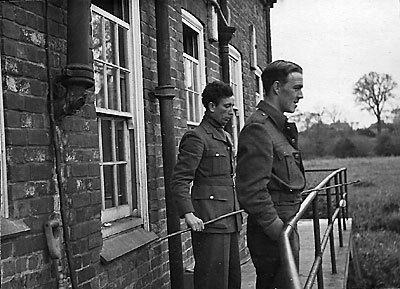 The RAF were the first to live in the mill after conversion and were responsible for converting the cart track to the mill into a proper metalled drive. 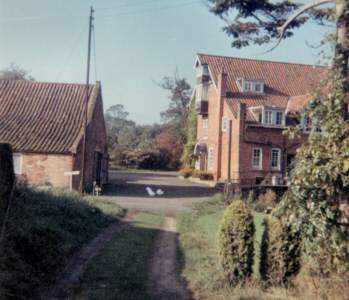 The officers lived in the mill and all their auxiliary staff lived in the mill cottage. King George Vl and the Queen Mother visited the pilots during their stay and Gladys Broughton also recalled seeing the Duke of Kent driving down Sovereigns Hill to the village in a maroon car. N.B. Some of the handwriting was not easy to decipher although the above is believed to be fairly accurate. My father, the M.O., had to check all the new pilot recruits. He checked the 1st recruit for colour blindness using the charts with coloured dots. The recruit said 5. My father said he was colour blind and rejected him. The 2nd recruit said the same! So he was rejected. Likewise the 3rd. But the 3rd chap said he was definitely not, and for my father to check the key in the back. Yes, it was my father who was colour blind and he was 28 by then! When Sir David Cunningham moved in shortly after the war, the gardens were overrun by moles, which were removed by attaching a hose to a car exhaust pipe and burying the other end in a mole hole. 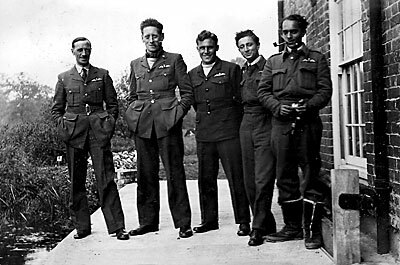 Sir David Cunningham employed three men, Donny Baxter, Willy Thompson and a Mr Bond, he had an operation and later took cyanide and was found alongside the river with his feet in it, very sad and Brian Hoolhouse was one of the people that went out to find him. During the 1960s the footbridge bridge was swept away by floods and a simpler bridge was later rebuilt using telegraph poles and wood slabs. 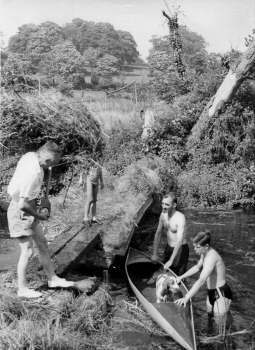 The above right hand photo shows Jim Bonham from Hawaii, Jonathan Neville, Derek Neville, Martin Ellis and dog Sammy. 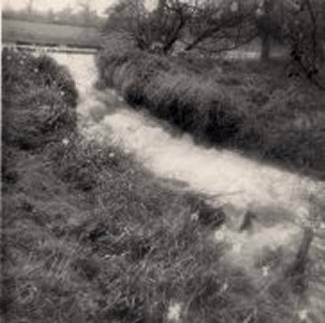 In the spring of 1961 the river burst its northeastern bank some 100 yards above the mill and reverted to what was probably its original course. I remember cycling back from school one lunchtime and finding the river bed above the mill completely dry except for a few puddles. The river had gone. 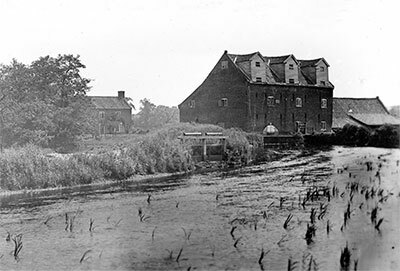 Several acres of meadowland to the north and northeast of the mill were under water as the river went around the mill with the majority of the water rejoining the main channel at the lower end of the millpond. After a few days the river board workforce turned up and began laying a wall of bags filled with chalk. 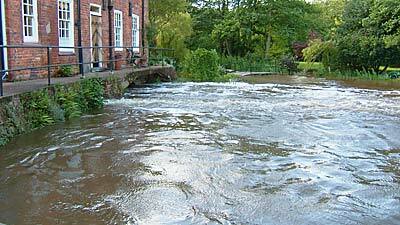 The force of the water had been considerable due to a drop of several feet and when the flood subsided we saw that an island had formed in the river at the point where some of the water, having flowed along a ditch, returned to the new riverbed just below the millpond. I played on it for many years. 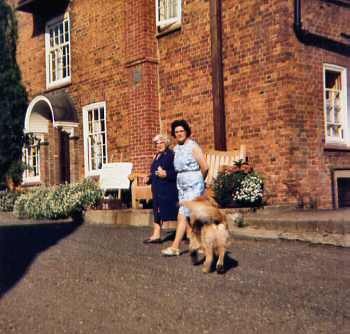 Edith Thaxter was Gladys Broughton's sister and for many years they lived in the cottage next to the school. The oak bench in the background of the right hand photo above was shortly to be transported to Australia in commemoration of Blackburn's Island whose original name had been reinstated as a result of the book Blackburn's Isle written by Derek Neville tracing the voyages of David Blackburn. 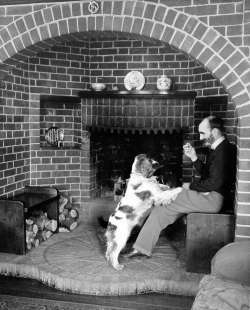 During conversion to residential use in 1938, a new fireplace alcove was built on the site of the wheel housing and a section of the cast iron pitwheel was incorporated into the brickwork above the hearth. A millstone was used as the centrepiece of the floor and the two wooden benches were made from mill timbers. 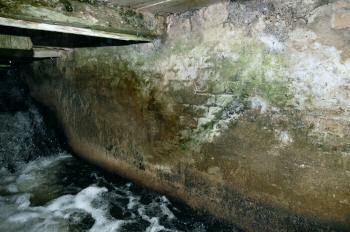 In the 1990s a glass plate was inserted into the lounge floor over the site of the wheel and the river can be seen rushing through below. Another millstone was used a the front doorstep and a further two were incorporated into the back lawn. All the millstones were French burrstones, which meant the mill was grinding wheat for flour. 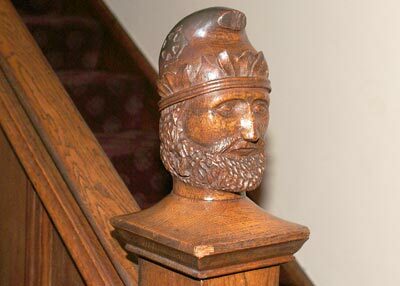 At the foot of the main staircase is a carving of the Saracen's Head. It was carved by Fred Smith of the Smith family building firm, Girling & Smith Ltd. of Cromer, who converted the mill to residential use in 1938. 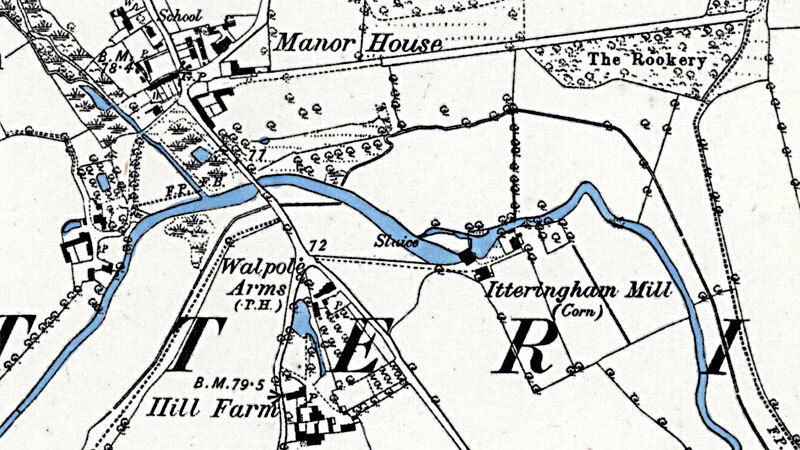 The only local connection appears to be that of the Saracen's Head pub on Lord Walpole's nearby Wolterton Estate that originally owned the mill. 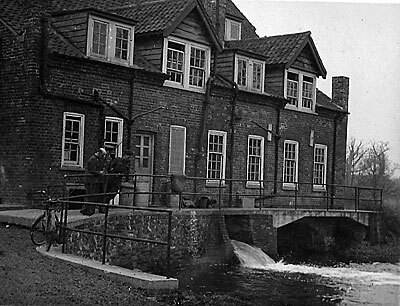 In the 1960s new oak sluice gates were installed by H. Newton & Sons of Cley. 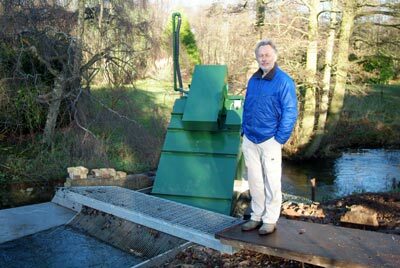 The wheel bypass sluice had not been raised for some 10 years and the mill pool, which used to be some 12 feet deep, had silted up to within a foot of the surface over most of the pool area. When the new gate was raised the whole millpool boiled as a vast amount of trapped methane gas was released. Within a few weeks the water was back to its former depth. During renovation work in 1938, the builders discovered the inscription R.W. 1783 scratched in the plaster at the back of the water wheel and this was left intact. It was found again in April 2009 during the extensive alterations of that year. 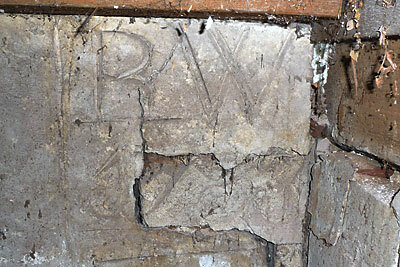 Local historian William Vaughan-Lewis, identified the RW initials as belonging to Robert Ward, a bricklayer who was very active locally on the Wolterton/Mannington estate in the 1770s and 1780s. He may even have been the son of Valentine Ward who was active in the same trade during the 1740s.